Good to be back. That Stallone has got a lot to answer for!!! I used to read 2000ad about 20 years ago but eventually drifted away - now that I think about it, it was around the time of the Stallone movie which as I recall had a serious effect on the prog!! Anyway, I bought the new film recently (much better!) and have started reading the Megazine again and have been really enjoying it. So, I decided to join the forum and get involved with all the discussions - I have to say, we never had this ability when I was a lad and I'm really impressed with the community on here from fans to artists - its ace!! Yeah - seen the new movie a few times now and it gets better on repeat viewings! The original, well what can I say - it has to be seen to be believed! Channel 5 seem to show it every now and then so keep an eye out!! movie. I remember being swept away by the hype at the time, and the excitement of seeing MC1 on the big screen, and walking into Woolies or Toys R Us to find the array of plastic crap that film spawned. I've still got my empty JD bubble blower and my JD stationary set. Ha! I've still got the 'sci fi special' they did to coincide with the movie. 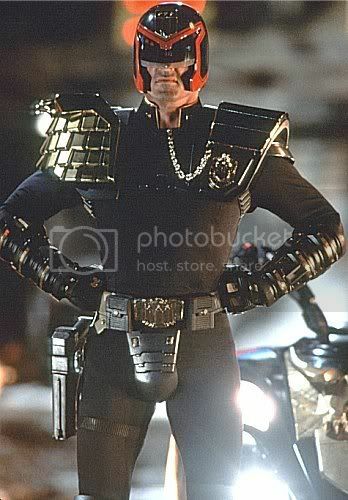 With "Seven Pages of Judge Dredd Movie Stills"!! I have not seen it for a while but as I recall mean machine and hammerstein were good. It's just that Stallone was so corny, but I guess that seemed to be how he was at the time e.g. demo man, rocky v, assassins. Worst still is the bizarre cod piece Sly sported ..... and the comedy side-kick. All that aside, I think they did a reasonable job of the scenery in the Cursed Earth as well as in the city. Where the latest film wins hands down for me, is a much less ambitious script giving the film a feel of a regular storyline. Really?? Did you not like the cod piece?? Ha! Ha! I have been chuckling to myself about that piccy since I posted it!! In fact, all this talk of the old film has made me kind of miss it. I had to get a fix via YouTube - as you say MC1 and the cursed earth look great - he just couldn't keep that darn helmet on could he?? If you think about it, without Sly showing how it shouldn't be done, maybe Karl wouldn't have got it so right. Hi, all. Hope you're all well. Late thirties latecomer to 2000AD. Read some relaunched Eagle, Scream, etc, as a kid but don't remember ever reading 2000AD. Dunno why. Got Dredd Case Files 01 case files soon after it came out and have been picking up one a year or so since. Just finished Case Files 05 and am reading the first Strontium Dog Agency Files and Flesh just arrived last week too. I'm at a very picky stage of my life where almost all forms of entertainment are not quite cutting the mustard, for one reason or another, but loving the 2000AD thrills. I cant believe its taken me this long to finally sign up! I inherited the interest of 2000ad from my dad so have been born into this craze! Long time lurker in these parts (and I'm talking years and years here), signed up a while ago and still have yet to post. Hey all! I'm a longtime lurker, recent-ish signer-upper and have been reading 2000AD since I was wee.